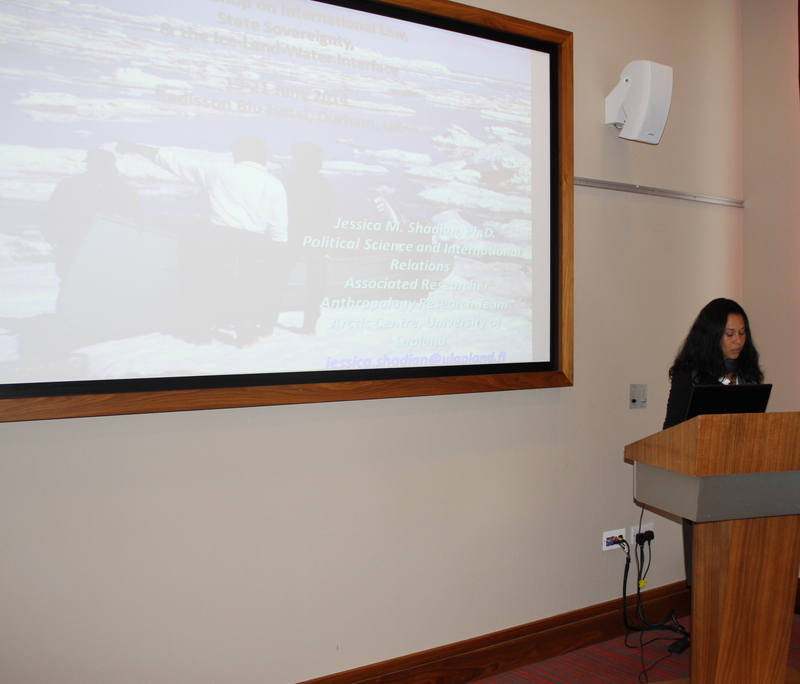 The Ice Law Project’s launch – a workshop bringing together experts from a wide range of academic fields, from lawyers to anthropologists – was uniquely interdisciplinary, prompting us all to re-think pre-held assumptions. The aim was to question the modern state system’s (and often our own) assumption of a clear-cut land/water binary, but the workshop also prompted us all to face our own academic disciplinary boundaries; Bringing law into anthropology and anthropology into law is easier said than done. Furthermore, the workshop provided a fantastic opportunity for us all to see our own research – be it related to ice or not – from a new angle. In my case, the topic was highly relevant to my doctoral research project, and was thus helpful in generating some novel ideas. I am interested in the ways in which the Arctic features (or does not feature) in the eight Arctic states’ leaders’ perceptions of the states’ identity. Or, phrased differently, what an official status as an ‘Arctic state’ means for (national) identity at the decision-making level. Clearly, one of the questions that arises is how the Arctic’s materiality – the fact that it is largely ocean-space covered by transient ice – impacts a sense of belonging to the area. National, or more generally spatial, identities have often been found to be linked to property rights and territory. Indeed, perceived ‘homelands’ or spaces in which a community feels ‘rooted’ tends to be connected to historical habitation, cultivation and/or some kind of usage. So what then of the Arctic Ocean and its famously disappearing ice cap? The United Nations Law of the Sea Convention (LOSC) is arguably more relevant to state-identity with regards to the Arctic than one might first think. By laying down strict legal definitions of how the sea may be delimitated, it allows an extension of ideas about land to water. By emphasising concepts such as the continental shelf, the focus is shifted from water’s liquid, ‘uncontrollable’ nature to the underlying, solid ‘land’. Land that, additionally, holds values to be harvested and used for the communities’ benefit. In this manner, the Arctic states’ submissions for continental shelf-claims in a way extends their perceived ‘homeland’ to a space that has never been habited in the same way that their land-territories have. So, again, what then of ice? The interesting thing about ice here is its shifting nature. Although, at first glance, it might seem solid enough to be considered similar to land, it moves, shifts, thaws, melts, disappears, re-appears, calves, and re-grows in ways that challenge this. Instead, ice tends to be viewed as water; it just happens to be in a temporarily awkward form. At least that is what a strict reliance on LOSC would suggest – with a mere mention in relation to regulation in one short article (234), ice’s uniqueness does not seem to be more than a hindrance to be overcome. Indeed, the ways in which the Arctic ice-cover is spoken about is often as both a hindrance (to shipping, resource extraction, safety measures etc.) and an embodiment of climate change in its rapid melting. It is water in a more difficult state, yet it is in a state that we ought to appreciate for what it signifies. Either way, the actual usages, meanings, and highly varying and mobile characteristics of ice are largely overlooked or ignored – if we even can talk of ice as a unitary concept at all. Ice as enabling transport and travel, enabling hunting; indeed, as vital to people’s livelihoods easily disappears in a cacophony of political, legal and economic claims. In terms of building an identity around a legally defined Arctic space (albeit, under water), ice-cover is a complicating factor. It is neither the solid seabed, nor the liquid ocean, but something in-between. Seen as a challenge to be tackled or something vulnerable to be protected, its existence, mobility, and altering extent render Arctic identity-formation far from straight-forward. And so, the ways in which ice-cover comes to be legally governed will have significant implications beyond the immediately obvious – it will, indeed, dictate how these ice-covered spaces are to be conceptualised. And thus, it has the ability to determine the way in which nation-states may or may not adopt these areas as part of their identities’ spatiality, in turn legitimising or de-legitimising certain approaches to the Arctic’s future. In the end then, as the workshop in Durham came to a close, I was left with a whole new appreciation for the importance of including the human aspect in the development of law; as well as the importance of law for human perceptions of reality. Working on a dynamic, mobile, and changing element such as ice requires also us to be academically and conceptually dynamic, mobile, and open to changing our assumptions ourselves. By recognising the discursive power inherent in the development of legislation – power to influence our view of the world – we may, as a first step, be able to confront our own assumptions about the far-from static world in which we live.